Perhaps the biggest controversy in Oakland Township has been the Proposed Blossom Ridge senior community. In June 2011 Moceri Development proposed a senior community on the Northwest corner of Adams Rd. and Dutton. 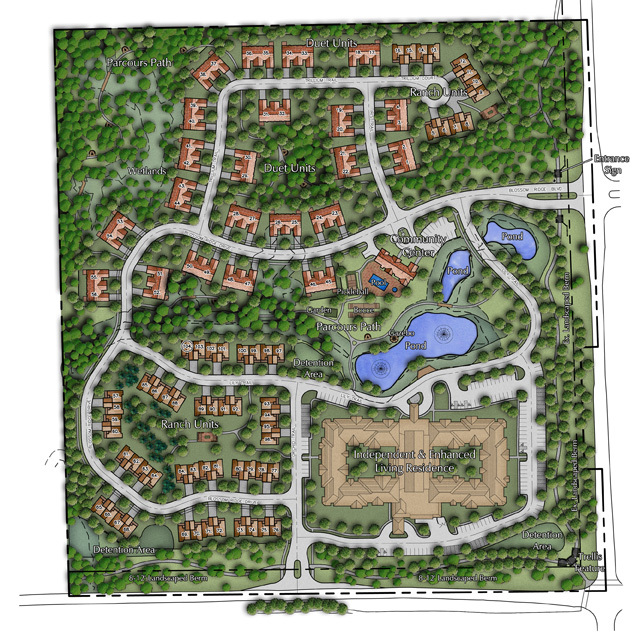 The Plan is for 238 independent and assisted living units on a 41 acre parcel. There is planned to be a number of duplex buildings, a large residential building and a community/recreation center. The plan calls for the site to remain heavily wooded with 53% open space (23+ acres) including paths, ponds and streams, and 41% less building hardscape coverage. Walking trails would wind through and around the natural features and provide exercise stations. Planned berms with natural landscaping along Adams and Dutton will virtually hide the development from the outside and lessen traffic noise for residents. Throughout the year, many members of the community spoke against the Blossom Ridge development, citing traffic, safety, density, character and property value concerns. The Planning Commission recommended approval of the rezoning to the Board. August 14, 2012 -The former Board approved the re-zoning. August 15, 2012 – Special Accommodation request submitted. Citizens circulated and submitted petitions for a referendum on the rezoning. The former Board considered the developer’s application for consideration of a Special Accomodation Use under the zoning ordinance to comply with the Federal Fair Housing law. This would have the effect of allowing the development regardless of the outcome of a referendum on the zoning change. Supervisor Fogler recommended that the Board approve the Special Accomodation Use. The former Board postponed and the referendum went forward. After hearing our Township Attorney Steve Joppich’s opinion on the requirement for the CZC review, the new Board decided to ask another attorney for an opinion. moved to seek a fourth legal opinion from another attorney on the CZC review. March 26, 2013- Oakland County Zoning Coordinating Committee recommends approval of rezoning for Blossom Ridge. April 9 2013 – Board set the date of the Blossom Ridge referendum to August 6 2013. There are many issues remaining: the outcome of the referendum, the delayed Special Accomodation Use decision and a Federal Fair Housing Act complaint. We will keep you posted. 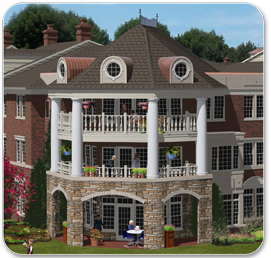 I am very interested in this senior community, I presently live in Lake Orion in the Preserve and looking for a beautiful place to live my next phase of life. My life style is active and would love to live in one of Moceri’s developments. His places are beautiful. It sounds as if you are not giving up… Hope it makes it. Unfortunately, the decision to proceed is now with the Federal Government. Their investigation into the discriminatory practices of Oakland Township could force the Township to accept the development. When will this facility be open? I am not sure, but I suspect not until 2018.